An Australia visitor wrote, I seek to find out what speed our sun is traveling at and also how many years does it take to circumnavigate the galaxy? Our Milky Way galaxy is a collection of several hundred billion stars. 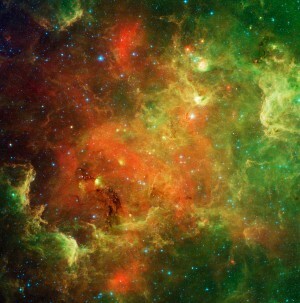 It has an estimated diameter of 100,000 light-years. Our sun does indeed circumnavigate the Milky Way galaxy. In space, everything moves. There are various estimates for the speed the sun travels through the galaxy, but its speed is about 140 miles per second. Likewise, there are many estimates for the length of time it takes the sun to complete one circuit of the galaxy, but a typical estimate is about 230 million years. That period of time, by the way, is known as a cosmic year. It so happens that astronomers know which star the sun is moving toward, in its journey around the galaxy. In January, this star appears in the west-northwest at dusk and nightfall. It also appears in the east-northeast at and before dawn in January. It is one of the loveliest stars you will ever see, Vega in the constellation Lyra the Harp. Our sun’s direction of motion (and thus our Earth’s corresponding motion) toward Vega has a special name. It has called the apex of the sun’s way. 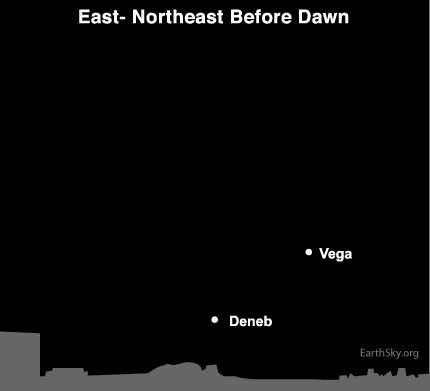 Vega – the solar apex star – can be found in the eastern sky during the dawn and predawn hours throughout January.